I was looking through my punches today and I saw my spiral punch and thought that I should use it again. 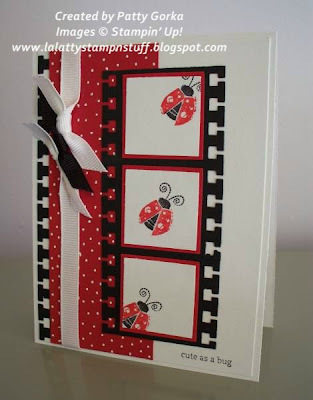 I recently made two film strip cards found here and here, but I thought this time I'd like to make one using ladybugs. I colored the ladybugs using my SU markers and then I punched them out using my square punch. I tried to punch them so that it looked like it was flying across the 'film strip'. I added some dots using my white gel pen on my real red card stock. Then I added a punched edging using black card stock and my spiral punch just along the left side of my card. My sentiment is from SU's Love Bug stamp set and my ribbon is from Offray. Thanks for stopping by! See you tomorrow. 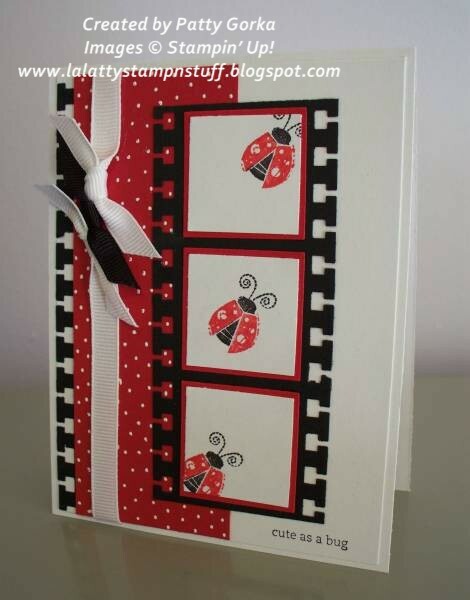 Oh Patty, I just love your film strip lady bug card! It's a real eye catcher, I've been seeing that punch used by several people lately. I might have to get mine dusted off and use it too ;) Thanks for the wonderful inspiration!